Germany become the fourth consecutive European side to crash out in the group stages after winning the previous World Cup. Following in the footsteps of France, Italy and Spain, the Germans limped out of this competition with VAR playing a huge role - yet again - as an offside call was correctly overturned in the dying embers of the game. Son hit Germany with a second on the break with Manuel Neuer deployed deep into the opposition half. It was the simplest of goals for the forward, rounding off a humiliating afternoon for the World champions. ​Germany had endured a slow start to their World Cup campaign but it wasn't the first time they’d lost a game in the group stage. Victory over South Korea would've comfortably seen the world champions through to the knockout rounds. South Korea meanwhile were still harbouring a slim chance of advancement themselves, despite losing their first two games. Even with it all to play for in Group F, it was another performance typical German at this tournament so far. In the opening stages as they kept possession well, but struggled to create anything of any real quality in the final third. Despite the tempo, it was a game of few clear-cut chances until Lee Yong sent a searching ball into the box. Sule made a half clearance which fell right into the path of Son Heung Min. The Spurs forward looked certain to make it 1-0 for his side, but blazed his effort high over the crossbar. Mats Hummels was the latest player to fluff his lines after latching on to a ball around the six-yard box. Turning inside his defender the German had the entire goal to aim for, but tapped a tame effort right into the hands of Hyun-Woo Cho. Son Heung Min created a good opening for himself deep into injury time, but dragged his shot harmlessly wide. Those were the first and only real chances of the first 45 minutes in a game that was desperate for an injection of quality. 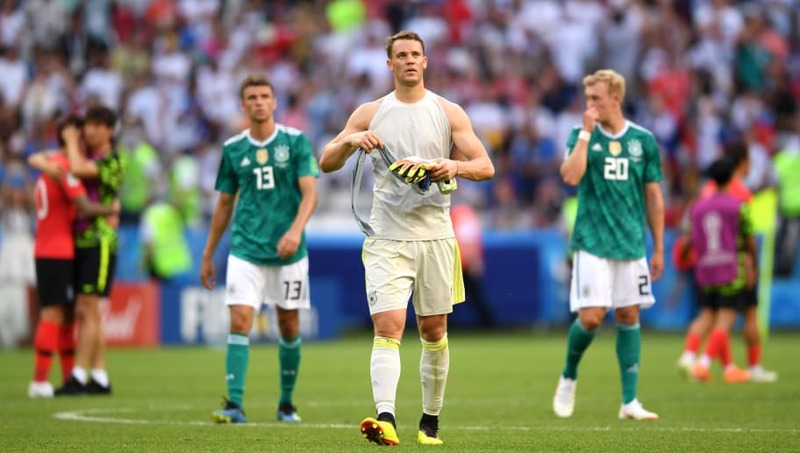 Wayward crosses looked to be the order of the day yet again for Germany, they completed four times as many passes as their opponents but never looked like threatening the goal; managing just two shots on target. While South Korea lacked the guile to open up the German defence having to play a spectator role for large spells and needed someone to take charge of the game. ​​Germany finally found the killer pass just moments into the second half with Joshua Kimmich picking out Leon Goretzka in the centre of the box, forcing an excellent save Cho. Timo Werner missed another great chance for Germany minutes later, meeting a cross field ball in the box but once again dragging the shot wide. Things also took a turn for the worse around the same time in the other fixture with Sweden taking the lead against Mexico. Those misses now looked very costly, with the world champions on course for an embarrassing early exit. Germany responded well as they continued to press South Korea with an array of shots in the opening stages of the second half. It looked like it would only be a matter of time before they got the breakthrough but time was against this struggling side. There was a growing concern that Germany could be caught out on the break, just as they were against Mexico. Son exposed the space with a pacy counter but the final ball wasn't good enough, allowing Hummels to cut out the attack and regain possession. Andreas Granqvist added a second for Sweden in the other game, and Low responded by throwing Mario Gomez and Thomas Muller on from the bench to add some extra firepower for Die Mannschaft. Seon-Min Moon looked certain to pile more woes on the Germans as Son picked him out free in the box, but the Korean contemplated his shot for too long wasting the best opportunity of the game for his side. Gomez joined the list of German players to squander a golden chance in this game guiding his unmarked header comfortably into the hands of Cho. Son came close for his side on the break again as the game really began to open up entering the final 15 minutes of the game. We saw late drama from Argentina and Marcos Rojo on Tuesday, and history looked to repeat as Germany's own centre half Hummels had the best chance of the game in the exact same 86th minute. This time however, the centre back couldn't covert. Kim Young-Gwan looked to have won the day for South Korea, with both sides painfully waiting for confirmation of the goal from a VAR review. The linesman's offside flag was correctly overturned as the Germans suffered even more humiliation in injury time. Manuel Neuer surged up the field to support the attack with Germany desperate for a goal, but his decision backfired as South Korea hit on the break, with Son turning the ball into an empty net rounding off a late double. In the end, it was nowhere near good enough from this German side who've been poor from the first kick off. They survived courtesy of a late goal against Sweden, but there was to be no late comeback this time for the Germans, as they crashed out in the group stage for the first time.